Barcelona’s Montjuïc Mountain will unearth a trove of art. It has always been a popular excursion for the residents of Sants and Poble Sec neighbourhoods, its free mineral springs attracting large Sunday picnic crowds throughout the nineteenth and twentieth centuries. 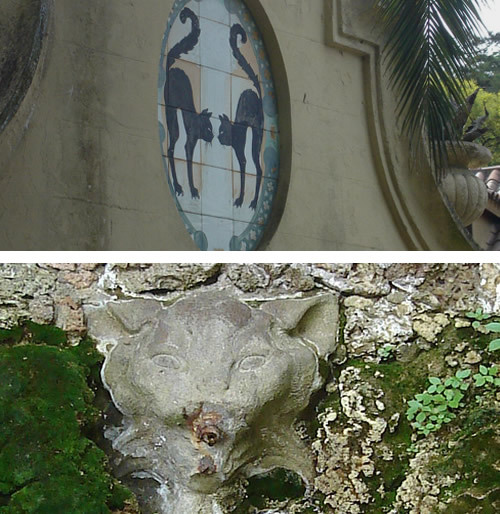 The mountain is dotted with many of these springs—works of art themselves—but none so renowned as the Font del Gat [spring of the cat] in the Laribal Gardens. When landscape architects Forestier and Rubió Tudurí were commissioned to create gardens from the former estate of wealthy lawyer Josep Laribal for the 1929 International Exhibition, they chose as inspiration Granada’s Gardens of the Generalife, creating the different spaces of the font del Gat, the stairs of the Generalife and the Mediterranean gardens, which included three statues of female forms displaying differing styles from the late 1920s. 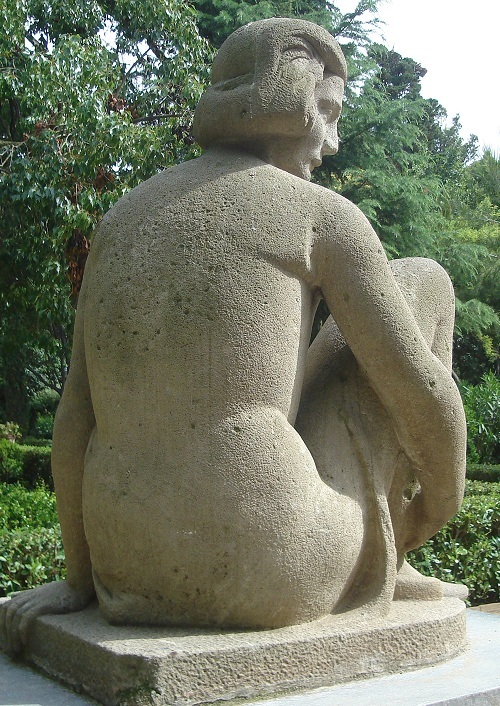 Repós (Rest, 1925) by Josep Viladomat, versioned on an original by Manolo Hugué, is carved in rough stone that well suits her heavy repose. The stylised, neo-Baroque lengthening of her limbs is also present in others of his works such as “Woman with Boy and Flute” in Plaça Catalunya. The accentuation of her full limbs prefigures Henry Moore’s later abstracting of positive and negative volumes. 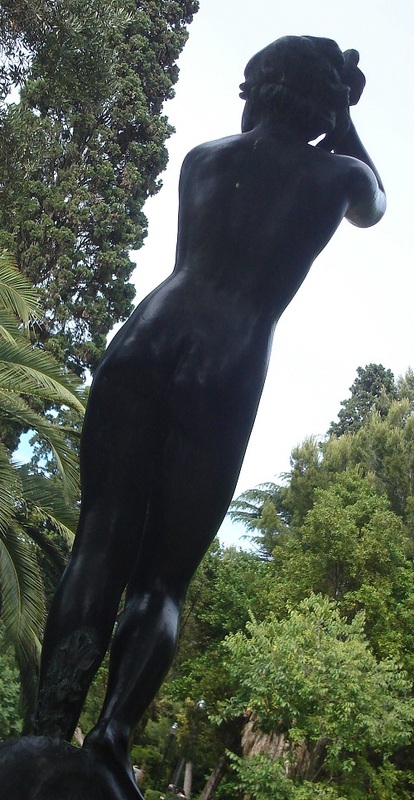 The second figure, La noia de la trena (Girl with the Plait, 1928), by the same sculptor, is the most naturalist of the three. Cast in bronze with a dark patina, she could be Marieta of the lively eyes from the popular song about the Font del Gat, confidently baring herself for her tryst with the unknown soldier. 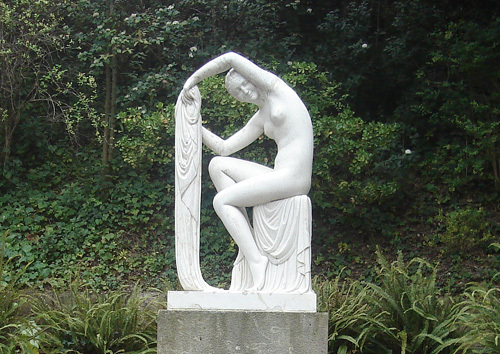 Most spectacular, however, is Estival (Summery, 1929), an Art Deco piece in white marble, created by Jaume Ortero. She is a seated figure, representing the atmosphere of summer, perfectly sited before a pool, within a Mediterranean-style rose garden. It is worth making this visit just to experience the harmony of this piece within its surroundings. Close by is an enamel-tiled fountain with marine motifs by ceramicist Llorenç Artigas. Estival by Jaume Otero, 1929. Girl with the Plait by Josep Viladomat, 1928. Rest by Josep Viladomat, 1925. Jardins de Laribal, passeig de Sta Madrona, 2, Montjuïc. Thanks for the extra information. I’ll look out for this movie.